Although you may think that bottled water is a safer option than tap, two new reports show that the store-bought stuff is actually less regulated than the water you get out of your faucet for free. Unlike tap water, the Food and Drug Administration (FDA) has little authority to regulate bottled brands, according to a U.S. Congressional report released this week. 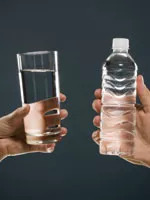 THURSDAY, July 9, 2009 (Health.com) — Although you may think that bottled water is a safer option than tap, two new reports show that the store-bought stuff is actually less regulated than the water you get out of your faucet for free. The Food and Drug Administration (FDA) has little authority to regulate bottled brands, according to a recently released U.S. Congressional report. While municipal water utilities are required to provide public reports of test results, bottled-water makers are not. (On the other hand, well water, which is found in many rural areas, isn’t regulated like water provided by towns and cities.) So although you may fork over a pretty penny for bottled water, that doesn’t mean it’s any better than what’s coming out of your faucet. In fact, it could be worse and you’d never know it. Reaching for the most popular bottled brands isn’t necessarily a solution. In fact, the EWG report found that some of the best-known brands—like Whole Foods and San Pellegrino—are the least likely to report where the water comes from and what it contains. Next page: So what’s a safety-conscious shopper to do? In recent years, some reports have suggested that tap water could be contaminated by trace amounts of pharmaceuticals or other substances. Leiba says that activated carbon water filters—like Brita pitchers or faucet attachments—are a safe and affordable option for filtering tap water. If families can afford it, she recommends a reverse osmosis filter, which will eliminate all impurities. These reports come as food safety concerns seem to be at an all-time high. Lately, recalls of spinach, sprouts, peanut butter, and, most recently, cookie dough have made many consumers start to question the safety of the items they find on grocery-store shelves. Unlike tap water suppliers, bottled water companies don’t have to have their water tested by a certified laboratory, and they aren’t required to notify customers within 24 hours if they find elevated levels of contaminants. The FDA does require bottled water companies to test for contaminants and other problems, says Joshua Sharfstein, MD, the agency's principal deputy commissioner. Only changes in the current regulations would make it mandatory for manufacturers to make those kinds of records public, he says. Those regulations may change with the Food Safety Enhancement Act. The proposed Food Safety Enhancement Act covers many aspects of food safety, including better preventive control measures by food manufacturers, more frequent inspections of facilities, and greater FDA authority over food recalls.